* Known issue: no support for any OSX version older than "Lion"
* Please let us know how running the app is impacting the responsiveness of the Lion Desktop. Without updating to this BOINC version, you will not be able to get OpenCL work on Albert! Let's try and collect your feedback to this specific release (and this one only) in this thread. This machine used to get work, back before the mac app was discovered to have a problem. Now it cannot get work. Also, why is it talking about CAL? Shouldn't this be opencl? Mon Jun 11 13:12:18 2012 | Albert@Home | Sending scheduler request: Requested by user. Message 112113 - Posted: 12 Jun 2012, 8:46:28 UTC - in response to Message 112111. Thanks for the feedback. I need to check the plan class configuration, it's been a while since we last had the Mac app in the field . Message 112115 - Posted: 12 Jun 2012, 13:39:04 UTC - in response to Message 112113. Hmmmm....this could be a BOINC client problem. We are keeping this app in it's current state to allow teh BOINC developers to study this. You will probably want to disable ATI/AMD tasks on Albert@Home for now to avoid getting more of those aborting tasks. Message 112116 - Posted: 12 Jun 2012, 14:08:33 UTC - in response to Message 112115. OK, this seems to work in BOINC version 7.0.25, but this version had other issues with OpenCL unfortunately. Again, for debugging purposes, we now allow 7.0.25 BOINC clients to download atiOpenCL jobs for OSX Lion. Message 112118 - Posted: 18 Jun 2012, 14:51:52 UTC - in response to Message 112116. We have changed things slightly (the plan class name, actually) so that now the Mac OpenCL app should work with 7.0.27...7.0.29 . Message 112119 - Posted: 18 Jun 2012, 22:25:23 UTC - in response to Message 112118. Message 112120 - Posted: 19 Jun 2012, 6:50:35 UTC - in response to Message 112119. I just put a new version 1.26 on Albert for ATI/AMD OpenCL Intel OSX Lion, this one mainly has performance improvements. If it behaves well over the weekend, we will make a full test release of 1.26 for OpenCL on all supported platforms next week. Update: Fixed some problem that crashed the app under Mountain Lion preview, not sure this fixes it, tho. So newest version is 1.27. Message 112154 - Posted: 1 Aug 2012, 17:37:19 UTC - in response to Message 112126. I am not receiving any WU's (the latest Boinc client on Mountain Lion) - did you run out of them? Message 112158 - Posted: 3 Aug 2012, 8:14:42 UTC - in response to Message 112154. No, there should be plenty of them left (they are replenished automagically). Your PC is hidden, so can you give us some hints from the "Event Log" in Boinc Manager? 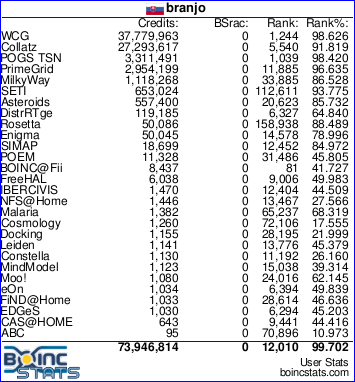 - IS BOINC actually asking Albert@Home for ATI jobs? Message 112159 - Posted: 3 Aug 2012, 19:47:32 UTC - in response to Message 112158.